Orissa bears the credit of ranking an exclusive position for hosting the largest category of tribal population in the ethnographic map of India. One can hit upon them, more or less, in every part of the state, especially in the hilly or forested areas. However, their lifestyles vary from region to region. The tribes of Orissa are chiefly categorized into three linguistic divisions, namely, (1) Indo-Aryan speakers, (2) Dravidian speakers and (3) Austric speakers. All the three classes enjoy a number of socio-cultural resemblances among them. The Indo-Aryan language line comprises Matia, Haleba, Dhelki-Oriya, Saunti, Laria, Jharia and Oriya. The Austric group includes primarily eighteen tribal languages like Parenga, Kisan, Mahili Bhumiji, Koda, Birija, Munda, Ho, Juang, Didayee Karmali, Savara, Mundari and others. Finally the Dravidian family constitutes nine languages in Orissa chiefly, Kisan, Koya, Gondi, Kuvi, Kui, Oraon, Pengo, Parji and Konda. 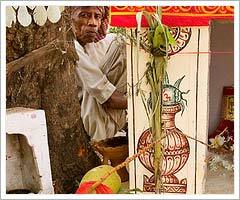 The tribes found in Orissa are not only religious but overtly superstitious as well. Every aspect of their life revolving the yearly actions is through and through linked with the numerous rituals and religious convictions. The tribes are so much attached to the nature, constituting the forests, hills, streams and their shelters that they believe their very existence is monitored by the supernatural powers co-existing along with them. They try to appease, follow and worship a wide range of Gods and apparitions, their constitutions being different from each other. While some are considered to be benign, a few are unbiased and there are others who are malicious. Another very important aspect of their religious side is the practice of various forms of rituals and sacrifices. As they consider every step taken by them is according to the whims and fancies of Gods, even for the simplest activity they first try to mollify the supreme authority. Sacrifices are carried out in the form of cattle forfeiting accompanied by the rites and ceremonies. These religious functions are generally presided over and guided by the religious priests. They hardly ignore a prophecy before undertaking any project. The rituals and festivals practiced by the tribal groups of Orissa are still being followed, respected and nurtured since the distant past to the present day. Generally the tribal festivals and ceremonies are categorized into two groups > those observed in the home front among the family members and those which bring the entire community together in the name of celebrations. The personal or domestic affairs include occasions concerning marriage, death or birth of an infant whereas the whole village get together to celebrate events like rich harvest and mellow fruitfulness. Few of the remarkable festivals celebrated by the tribal societies comprises Push Punei celebrated by the Juang, Karam festival of the Oraon, Guar ceremony of the Saora, Gotar festival of the Gadaba, Kedu of the Kondh clan, Magha Parab celebrated by the Santhals and Chait Parab observed by the Bondo. In fact, with the gradual passage of time, the tribal population have adapted and accepted few traditional Hindu festivals like Dusshera, Laxmi Puja etc. They have also shown interest and started worshipping Hindu Gods like Lord Jagannath, Shiva and Parvati.